"Gravity is not subject to time or space. It pervades the Universe without reference to time or space, instantaneously and without intermission. It is, however, a sympathetic flow, proceeding from the molecular or mass neutral centers to the earth's neutral center with a power corresponding to the character of each individual molecular mass." He [Keely] believed gravity dependent on the medium of the polar stream, for he says "If the sympathetic negative polar stream were cut off from the earth the molecular neutral centers would float away into space like a swarm of bees." "Under my system the gravital flow comes under the order of the "sympathetic concordant of the ninths" and is that third of the triune combination called the "polar propulsive." Gravity is polar propulsion while magnetism is polar attraction. 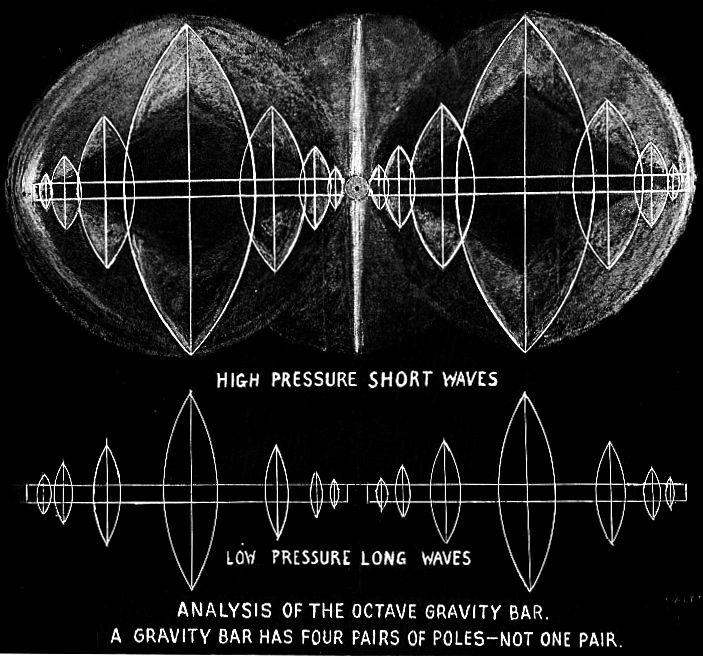 Both magnetism and gravity can be accelerated by proper vibrations." "Gravitation is the generative force of increasing potential and the regenerative force of decreasing potential. "Gravitation is the power within the electric force of action to attract the electric force of action. "Gravitation is the contractive power within Electricity to divert the universal constant of energy into centripetal vortices of closing spirals of increasing speed, thereby attracting similar states of motion into an accumulation of mass, the pressure of which increases toward its center. "Gravitation is an expression of the power of Electricity to accumulate by induction and, by so doing, to force magnetism to increase its resistance to that accumulation. Electric Potential and gravity are 90° in opposition. "Man makes a big gun by making a long tube which he seals at one end and places an explosive there. He even puts a twist in the bore of the gun; to accelerate the spin of motion around the still shaft which centers that tube. That motionless explosive occupies one still position in this zero universe until he ignites it. What then happens? A two directional explosion takes place. The recoil is equal to the discharge, so he might just as well have left both ends of the gun open as far as the effect of polarization is concerned. The recoil was the opposite direction of polarity, as that explosion began its division of stillness throughout the entire universe, at the speed of 186,400 miles per second. 369 - Hollingshead "Harnessing the Force of Gravity" using 3, 6 & 9 modes.